First, you need to print out the flowers. I printed them on Tissue Paper, because I love the thinness and transparency of it. If you have never printed on tissue paper before, you could follow this wonderful tutorial I found on YouTube! This is what your flowers should look once you have followed the printing and cutting instruction..
Next, spread a thin layer of Mod Podge onto your clean pretty plate..
..and carefully place and smooth your floral print on top.. While the mod podge is still wet– take a slightly wet q-tip or paper towel and carefully remove excess mod podge around the edges of the flower. And there you have it! 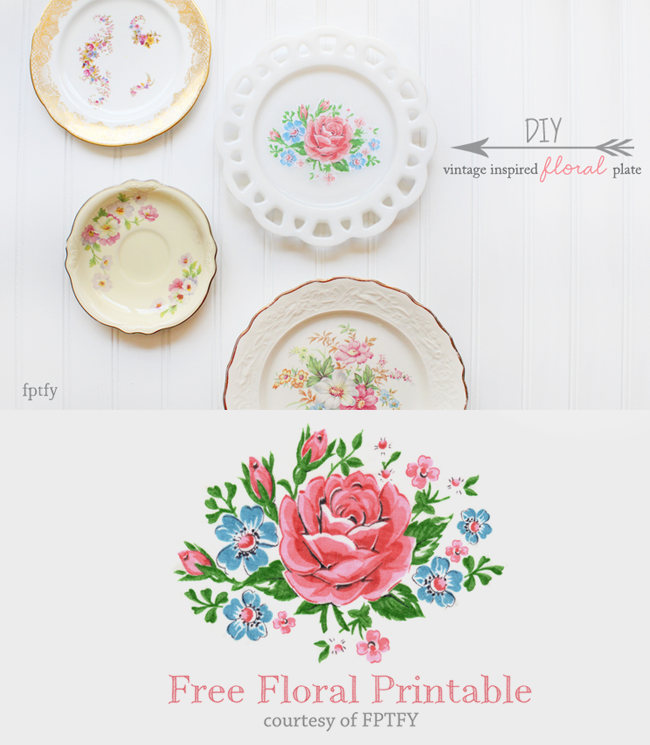 A gorgeous vintage inspired floral plate ready to adorn any (non humid) room! Love never gives up, never loses faith, is always hopeful, and endureth all things. Keren, I’m running out of words for these sweet gifts! Thank you sweet girl. This is right down my alley!! Hugs a million. This is such a pretty project! I have a plate that is similar to yours. I’ll have to practice with printing with tissue but I have bought images out of vintage images and made a tray with shells on it for my niece. Thanks for sharing!! Oh you’ll Love printing on tissue paper Katharine!!! Looks so dainty and pretty! Loving it and I can tell that wall will turn out super! now i’m on the hunt for plain white plates! Keren…girl, this is stunning! This is a project I really want to try and your flower prints are super pretty! Love that you printed these on tissue paper too. I have never heard of doing that and I’m excited to check that out too. Love you so much girl! Thanks for chatting with me today and helping me…again. Your friendship means the world to me! Gorgeous! Mod Podge rocks, lolol. The tissue paper tutorial is so cool! Paper jams are no fun, so it is nice to know that others have figured out a way to avoid them. I can’t wait to try this! 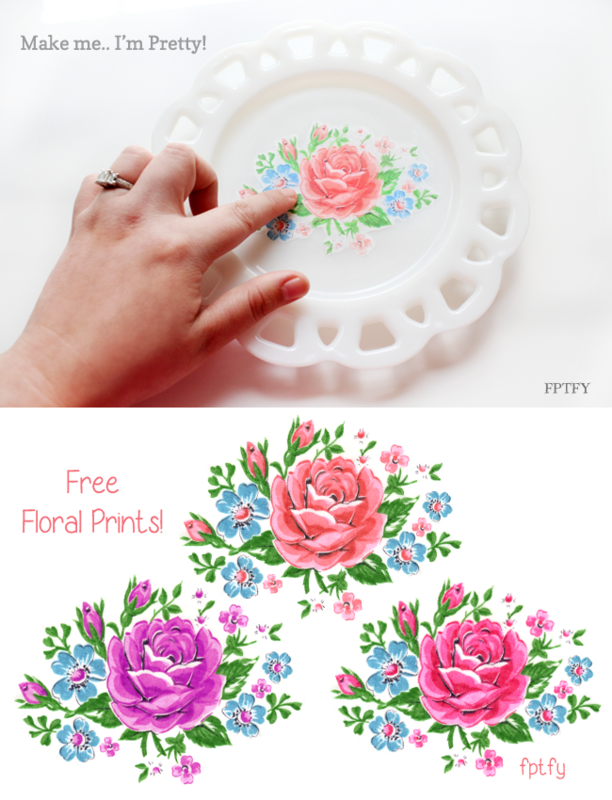 Your previous vintage rose clipart would look awesome on a plate as well. YES!!! MOD PODGE ROCKS!!! :D Where would the craft world be without it!!! Wasn’t that printing tutorial awesome! I’m addicted to it now! Oh, this is just so beautiful. I will just have to try this with some white plates I have hoarded in my cabinet. Thanks so much for the inspiration. Thank you my dear! You’re just the sweetest! Thank you sweet friend!! So :) you Loved it!! Im sure is you use this on top of it , it will work just fine in humidity! Thank you Sweet one! love all that you do! Thanks for linking up, this is just lovely! It reminds me of something my grandma loved to make! Thank you KELLY!!! Im beyond Thrilled you Love it!!!! XOXOXO!! I love your plate! I have a few plates on my wall too and would love a whole wall covered as well! I love this Keren, sooo pretty! I saw this over on Mod Podge Rocks and had to pop over here and pin it right away!! Hi Keren!! Just found you via Say G’Day Saturday and am so happy I came on over! Love your blog…it truly is very pretty here :) I’m your newest G+ follower. I have done a similar project in the past and I kept it for year. I just love the look of the flowers on the white plates. Thanks for the lovely flowers. It’s cuteeeee.but is it water proof? How did you hang this beautiful thing!!?? ?